He's 110 feet tall and has hands 20 feet long. He weighs over 750lbs and is filled with 258,000 cubic feet of air. It took 13 weeks to sew him together.And he's quite simply the biggest Gadget for God known to man. 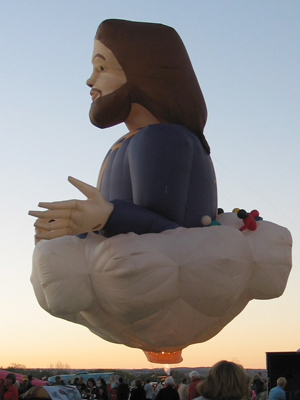 The balloon, which bears the slogan "King of kings, Lord of Lords" across the back of Jesus's robe, is currently touring the United States. 1000 blessings to Renee Beihl from Colorado for alerting us to this gadget on a grand scale.